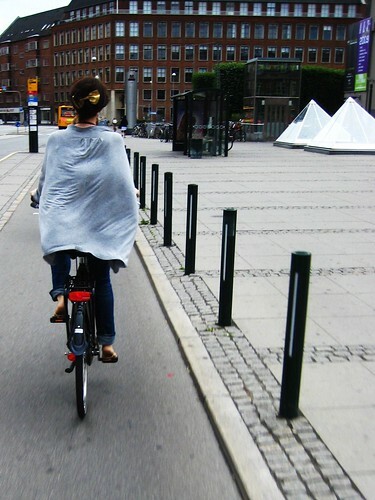 It was as though her blouse acted as a stylish, effective sail in the gusty winds. 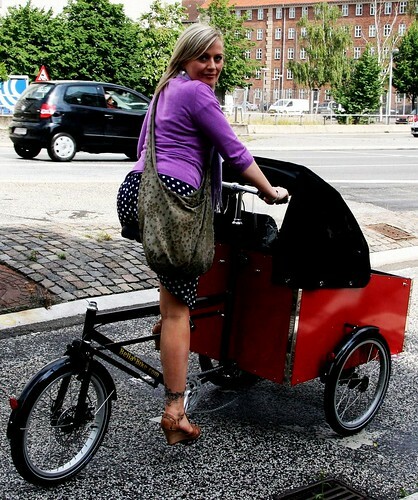 Bella Copenhagener on a Bellabike.com cargo bike - Photo courtesy of Bellabike.com. 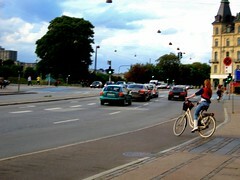 The Art of Entering Traffic - from a side street onto the wide, lovely bike lanes of Copenhagen. 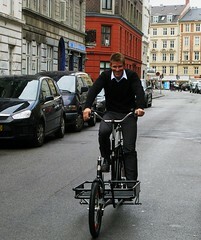 One of the two owners of Velorbis test driving my new Long John cargo bike outside their Copenhagen showroom. 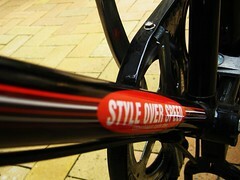 Style over speed, indeed. Wifealiciousness' Velorbis Victoria got slapped with Style Over Speed stickers from our little online boutique, too. One of our better commuting sites here just reviewed the Churchill Balloon and it sounds great. Now if only the dealer gave prices :( And I had a some cash for a new ride. Is blogger deleting my posts? or is CCChic rejecting them? Just had a question of where I may find more info on getting one of them BellaBikes in the US as the website does not seem to have the answer. thanks bloggerella!! du er fed! rob: yes, i saw it! very cool for my mates. You're looking at about 2000 of your dollars. man: we reject nobody! [almost] Bellabike doesn't export to the States just yet. Mostly Scandinavia. But they're working on it!